Geekpops: Wave or a Particle? I've just found a podcast for 'Am I wave or a particle?' from Geekpops! (I heard this on the Nature podcast last week). The lead singer of 'Spirit of Play', Wendy Texas, has a beautifully smooth voice - she reminds me of one of the singers from The Mamas and the Papas. I rather like the idea that anyone can play a useful role in science. You don't have to be in a laboratory with lots of expensive equipment or even have access to a library full of books and journals (though it helps, I say wistfully). All you need these days is access to a computer and the internet and you can take part in a grand Darwinian experiment. (ii) there are generally more snails because their arch enemy (or main predator), the thrush, have declined in number over the last thirty years. (It is my impression that thrushes are coming back again - I often hear them tapping away on snail shells. It is the sparrows that have declined. I used to see a flock of them descend onto the grass, but nowadays there seem to be very few). With thanks to Eric-the-blogless for pointing out my typos. Sunday Salon: A Duality of Art and Science. On the train last week I listened to the Nature and Chempod podcasts. I find it exciting to have the chance to hear all these eminent scientists talk about their latest discoveries. It is put in straightforward terms and is easily understandable by the non-specialists. It is also free. All you have to do is go to this Nature page or itunes and download. I highly recommend. This particular podcast ended with scientific pop. 'Am I wave or a particle?' the singer asked. 'Do I follow my mind or my heart?' 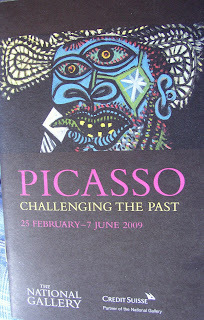 This chimed very well with what I was about to see: an exhibition of Picasso's work, the well-known cubist. I remember reading somewhere (I think in Insights of Genius by Arthur I Miller) that just as a cubist aims to portray two sides of a person's face at once, so physicists theorise that light also has two sides: from some 'angles' it is a particle, from others it is a wave. The art movement inspired the science, and according to another book by Miller (Einstein, Picasso), science influenced Picasso too. Reading through Miller's review of the book Surrealism, Art and Modern Science by Gavin Parkinson it seems like the two were linked by the work of Poincaré (another favourite of mine). The point of this exhibition in the National Gallery was not cubism but to show how Picasso took paintings from the past and used them to develop his own work. Amusingly, there were plenty of young art students there copying Picasso's work, so I imagined the whole thing as one of those halls of mirrors, the reflection going on and on, transformed each time by imperfections in the glass to something different, sometimes monstrous. 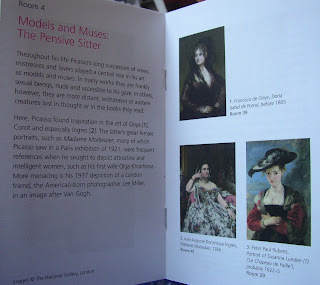 The originals were shown in a small brochure that accompanied the exhibition, which I suppose you were supposed to consult as you walked around. It makes interesting reading in its own terms. However, since this brochure was very small and I am no longer young this was an unsuccessful combination in my case (I need to bite the bullet an buy myself some varifocals). However, if there had been more information on the walls then maybe there would have been a viewing grid-lock. ('Ah, you can't win,' an Art Gallery curator would think if he were to read this, 'there'll always be some idiot grumbling.') Also I suspect there was more information on the audio-tour, but since I usually find those irritating, I didn't indulge - maybe I should have this time. 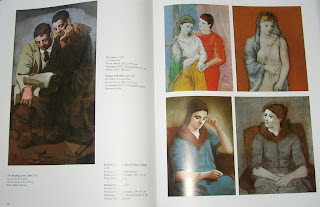 Since I now have the (imagined) attention of the National Gallery curator I would also like to say that it would have been better if the pictures were displayed in chronological order so I could have seen how the young Picasso developed into the middle-aged and elderly Picasso. 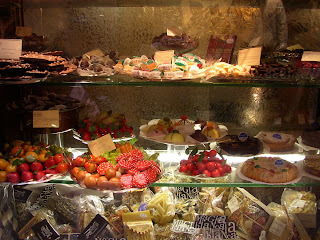 There was a sense of this, but since they were arranged thematically (still life, muse etc) it was not obvious. 'But everyone always does that!' My imagined curator would reply. 'Yes, for good reason,' I would answer back. I like to get the last word. Despite all this it was great to see the pictures before me and peer at them closely. I was surprised at how rough and unfinished they appeared to be, with dribbles of one colour over another. Standing back they disappeared, or rather were still there, indiscernible on their own but adding to the overall effect. All of Picasso's works seem to have a solidity about them which I really like. 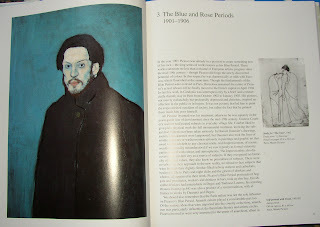 Even the thin sad people that he painted in his Harlequin period seemed to have a presence. Each one grabbed my attention and made me look and look. There were small tantalising details about his life: one woman and then another and another, and children appearing then being swept away with their mothers as another woman came on the scene. My interest now piqued in the genius of Picasso (and his outrageous love-life) I indulged myself even further and bought this book. 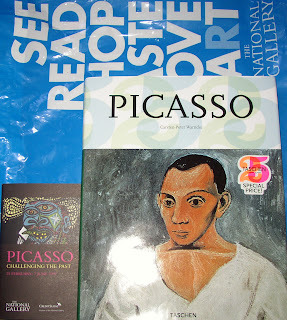 The excellent art publishers, Taschen, some of whose output is scattered on the downstairs Dudman bookshelves, are selling this book on Picasso at a reduced price to celebrate their silver jubilee. Apart from the familiar cubist pictures, there are many more conventional portraits, including several with the chubbiness of some of Beryl Cook's figures (though probably he was her inspiration rather than the other way round). It's a gorgeous book and I have enjoyed myself since looking at the pictures. Since I had a little time left I was able to visit the National Portrait Gallery and saw another exhibition I wanted to see (actually recommended to me by someone I've met on Twitter from Nature, Grace Baynes). 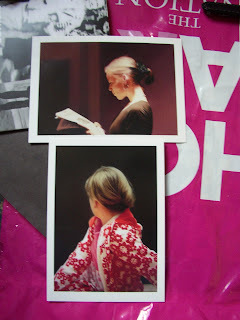 This was on the portraits of Gerhard Richter. Gerhard Richter takes evocative photographs and then reproduces them with astonishing realism in paint. Several are of his family, and some, like Picasso's are inspired by past masters. 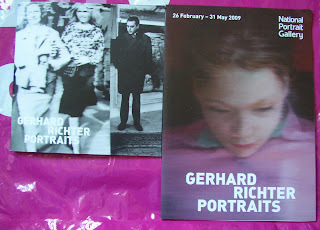 There is more about Gerhard Richter on Artsy - an excellent resource. I recognised some images from the internet, and I particularly like these which I think would make excellent covers for books. I finished off the day by meeting a few bloggers from Nature Network at the pub (including Matt Brown and Stephen Curry), which takes me back to Nature and another side of science. Normally silkworms are indolent, moving just enough to find a little more food, however, before they spin their cocoon they start to wander quite persistently. a white glimmering object on the floor of the airing cupboard, its outline diffuse with bur. An unnoticed escapee had somehow dropped the floor and then begun to spin. I am letting it stay there until it is properly finished. Even though I am fond of my silkworms I don't like the thought of them escaping. I imagine them crawling swiftly to my pillow in the night, like that mouse that once brushed my head when a child. Then I'd woke dreaming of lying at the bottom of a well, drops of water falling rhythmically onto my face - where, it turned out, the mouse was touching me as it ran around in circles on my pillow. aromatic twigs of bay, mashed up mulberry leaves and... silkworms (of course!). I think they look very contented in there. In fact, if they were capable of smiling I am sure they would be. I love the way they pick out the branches and crawl along to the top then pause there, their heads circling in the air in their quest to move ever higher. I suppose they are searching for the perfect spot, with their silk already beginning to spill from them. The reservoirs for the silk are two glands located either side of the intestine, and by this 'ripe' stage of the fifth instar these two glands are a quarter of the silkworm's mass. The silk is extruded by spinnerettes below the silkworm's mouth and their output is astonishing. In this Nature paper from 2003 Professor Florian Wurm (such a wonderfully appropriate name) from the University of Technology in Lausanne, describes how the one thousand cells in these two glands manage to produce 300mg of protein in four days. That is 80 micrograms per cell per day. He puts this in context: the productivity of mammalian cells, for example, comes nowhere close - the best that they can muster is only 50 picograms of protein a day. That is a million times more from the silkworm (according to my calculations). The silkworm, then, is a veritable little protein-making factory, and Professor Tomita and co-workers from the Japan Science and Technology Corporation in Hiroshima (report in another Nature paper) have joined in the quest to encourage the silkworm to produce something even more valuable than silk - that is various human proteins. Human albumin, for example, is in short supply. Even in a small country like Switzerland 1.2 tons are needed annually. This is usually obtained from processing 50 000 litres of blood plasma. And then there are other, even more valuable proteins like antibodies, which also require large cultures of human cells for their production. The silkworm is a potential provider of these too. 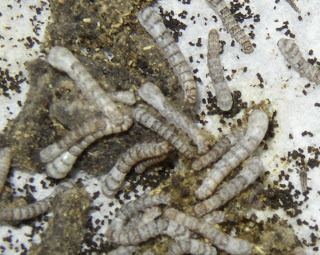 Apart from the greater productivity of the silkworm cells, there are other benefits of using insects as protein factories: the protein is produced in a pure form (and so does not require expensive and environmentally-draining purification), and there is virtually no risk of contamination by dangerous (to humans) viruses or prions. Professor Wurm reports that the genetic make-up of silkworms is altered by injecting a 'piggybac vector' into the egg of a silkworm. The piggybac vector is a way of changing the DNA of the embryo (without using a virus) so that the resulting larvae will produce silk that contains human protein (a form of collagen). To keep track of the larvae which carried the altered DNA a couple of markers were included: red-fluorescent eyes when the larvae were young, and green fluorescent silk (as well as the human protein). Glow-in-the-dark eyes and silk - my 'traditional' silkworms are beginning to seem a little boring in comparison. I woke up this morning to find four silkworms making cocoons. That is 30 days since they hatched. That is about a week longer than given in the literature. The interesting thing is that in two boxes there are two silkworms busily making cocoons; whereas there are none in the other boxes. I am wondering if hormone from one silkworm induces cocoon-making in a neighbour. One of my silkworms seems to be struggling with his skin. Normally I never see a moulting in progress. All I see is the silkworm motionless at the side of the box, his head raised from the floor rather like a sphinx with its skin shiny and taut. Then, a few hours later, I find the discarded skin - flat, brown, small and striped - stuck to the paper lining the box. It is the end result of a complicated process. The moutling process starts with the silkworm losing interest in its food. The caterpillar then has to become still as the new skin is formed beneath the old one. At the same time the old skin must separate from the body; some of this is reabsorbed to form the new skin, while the rest becomes hard and brittle and eventually slips off. During this time the silkworm is vulnerable. The new skin must be 'cured' and finished before the old skin is sloughed. But what causes the silkworm to lose its skin? It turns out that it almost the same thing that causes it to pupate. It is the result of some fairly simple chemicals coursing around the silkworm's body. I have been finding out a little more about their discovery - it makes dramatic reading. In February 1941 a Polish scientist called Stefan Kopec was arrested. He was an eminent entomologist and several years earlier his work had caused a stir. In 1915, he had discovered that two hormones were essential for pupation. However Kopec clearly did not confine his thoughts to insect physiology. He was also a member of the Polish Underground. For this liberal-thinking Kopec and his son would be shot. His death, in March, was a great loss to science and reported in Nature the following year. Kopec's work had already led to Muroga's experiments (that I mentioned in an earlier post), and also Fukuda's in 1940. Between them they worked out the origin and sequence of hormones required to turn a silkworm into a moth. Like all living things, insects respond to their surroundings. Silkworms react to the shortening of the day or a drop in temperature by secreting a hormone from the brain which then travels to a gland in the thorax. This causes another hormone, a steroid similar to cholesterol, to be released and this circulated throughout the insect's body. This steroid-hormone tells the tissues of the insect to change - but the 'change' that results (either a moulting or pupation or metamorphisis into adult) depends on the levels of another hormone, called the 'juvenile hormone'. The 'juvenile hormone' is secreted directly to the insect's body from a gland close to the insect's brain. This 'juvenile hormone' stops the larvae growing up. A high level of 'juvenile hormone' prevents metamorphosis and the steroid simply causes the caterpillar to moult; with lower levels of 'juvenile hormone' the caterpillar becomes a pupa, and then with another burst of steroid-hormone, the insect metamorphoses from the pupa to adult insect. Although Kopec had discovered that these two hormones were involved long before the start of World War Two it was not until the mid-nineteen fifties that scientists managed to extract the hormones from the silkworm and determine their chemical structure. As soon as Kopec's two insect hormones were isolated scientists started to experiment with them. An American scientist called Williams found that if a silkworm was dosed with sufficient 'juvenile hormone' it could be prevented from pupating indefinitely. The silkworm would simply keep eating and growing until it became enormous. If he then gave this giant caterpillar the steroid-hormone it would immediately start to pupate and start to spin a cocoon large enough to envelop its huge bulk. 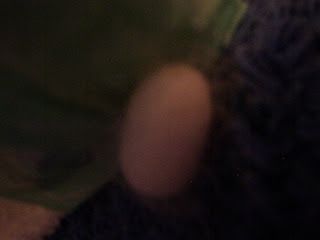 The cocoon that resulted was as large as a hen's egg. In this way silk production could be controlled - just by juggling those two chemicals Kopec had found fifty years earlier. But these hormones are not just found in insects. Interestingly, a very similar hormone to the moulting and pupating steroid is found not only in other animals - Crustacea and Arachnida - but in plants too (the Togariha-maki, a type of black pine, and the root of the Hinata inokozuchi, a variety of Achyranthes). Astonishingly, it was found that when this plant hormone is injected into a silkworm, the silkworm begins to moult then too. 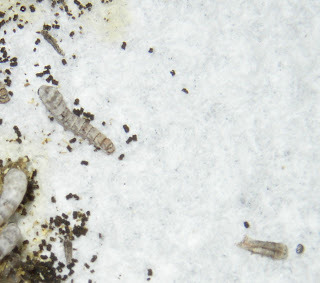 Furthermore, if a tray full of larvae in their last instar is sprayed with the moutling steroid, all the caterpillars begin to spin their cocoons at the same time. This is very useful, and to be honest I wish I had a little of that chemical now. The house is beginning to smell of mashed-up mulberry leaf, and I am starting to wish that my dear little silkworms would just get on with things. Labels: hormones, juvenile hormone, pupation, silkworm manipulation, Stefan Kopec, steroid. 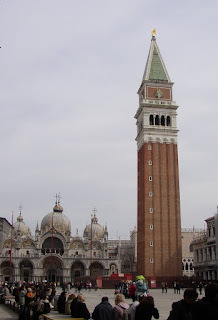 We had just three nights in Venice, but this book stretched out the visit to a whole week. 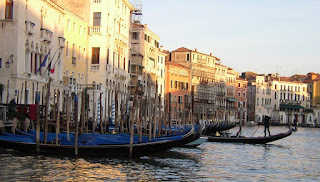 It is an extraordinary piece of travel writing. 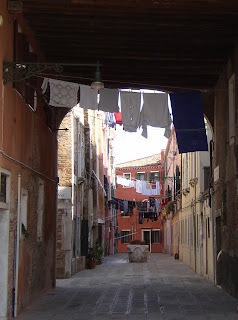 Jan Morris knows Venice. She lived here with her family, and uses this experience to the full in this book. 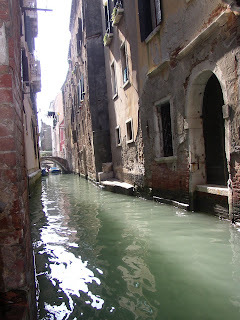 Somehow Jan Morris seems to become Venice. It is almost a merging of flesh and masonry. 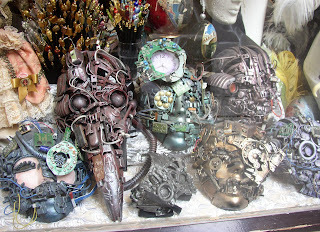 If a cyborg is a cybernetic organism, Jan Morris, in this book, becomes an urbanorg. 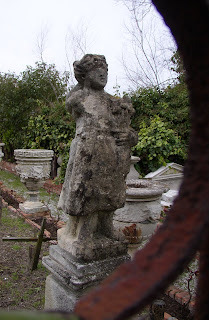 She is fond of the tattiness of the place, and its decaying splendour. 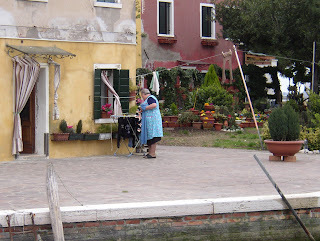 and the eccentricities of the people. 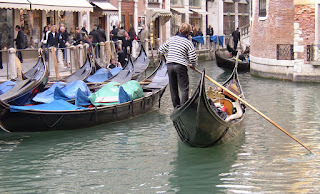 and affection (the gondoliers have their own code of practice and are not as extortionate as they appear because during winter they make barely a Euro). 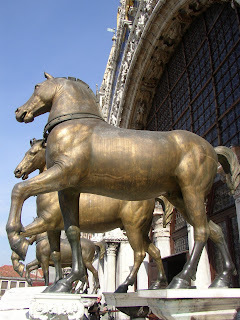 The history of the place is gently administered to the reader in the form of fascinating anecdotes (for instance the fact that some of the lions set into the walls of the Doge's Palace have letter-box mouths which used to swallow rumours and accusations that could send an innocent citizen to the gaol-house). and the brashness of the modern day is tolerated, but mostly ignored. When the time comes to leave she is sad, but has somehow conveys that she has had enough. 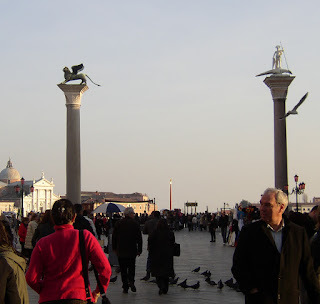 Venice is too rich to imbibe for long, she seems to imply. Even so - it must have been a poignant final scission. I am going to try and read the book again before I return - like the addition of a little spice it makes a marvellous experience even more memorable, and three nights was no where near enough. 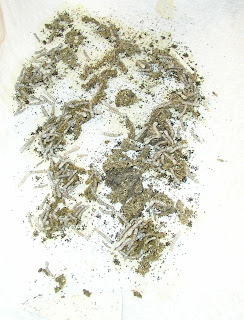 Despite Hodmandod Minor's somewhat nonchalant attitude to sericulture (throwing in a bit of silkworm diet after being nagged on the phone, then ramming down the lid and running away fast) there were surprisingly few silkworm casualties on my return. The night I got back I spent until midnight picking out withered grey corpses, putting them on fresh paper and grating in more food. Altogether there were about six - mostly in the box that was streaming with condensation - but there have been more casualties since. At one stage there seemed to be so many corpses every time I looked that I was thinking that my little colony was suffering from a plague (like the one that afflicted most of Europe in the nineteenth century) and could understand how desperate the sericulturists must have felt as generation after generation of silkworms succumbed no matter what anyone did. However, since it is mainly the small ones that have died, I think a lot of this must be natural wastage and there are about two hundred left. They are now eating very well and getting a lot larger. Even though they are as large as the twenty or so I had at the start they are still shedding skins (which my original ones never did) so I think they are in their fourth or fifth instar. They are easier to handle now, but the accommodation is becoming a problem. Yesterday I made one of my rare journeys into town and found that the cheap household store Wilkinsons sell ideal 7 litre plastic boxes for sericulture, so I came home with three. Hodmandod Senior then drilled hundreds of holes in their lids and the silkworms now look a lot more comfortable. 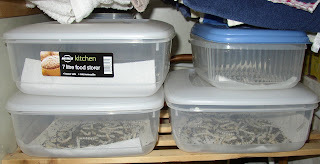 Silkworms at home in the Hodmandod Airing Cupboard - there are a second layer of boxes behind. and it is taking me a good hour twice a day to clean them out and feed them. Still, I'm sure it will be worth it (though can't think how, just at the moment). I just got an email from lovereading telling me I was a featured author on their website and inviting me to link back, so I went to have a look, but unfortunately could not find me nor my books. Since they invited me to ring them if I had a query, I did. A moment of puzzlement followed, eventually solved when it was realised my books were all out of print and so have been eliminated from their database. It is a sad reality for an author today, especially one of the literary fiction variety, that a book is in print for a far shorter time than it takes to write (and in my case research). However, the sun is shining and I refuse to be downhearted. My books had their day, and maybe my new novel will have its day too. The important thing is to not look back and keep going (and maybe try to persuade my publishers to look into print on demand). 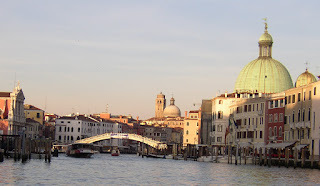 I have been away: to where domes meet spires; where the Byzantium citizens held off marauding nomads; and where there was so much awe-inspiring artistry in all directions that it was like something too piquant on the tongue. Eventually I couldn't taste at all. 'You've fallen in love with it.' My mother said, and I think I have. The rest of the world fell away. 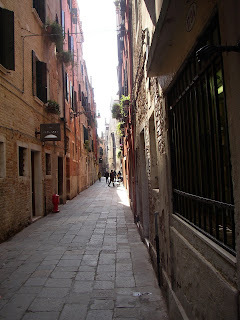 Gold leaf glittered on the walls and narrow lanes ended abruptly in the gentle green of jade. 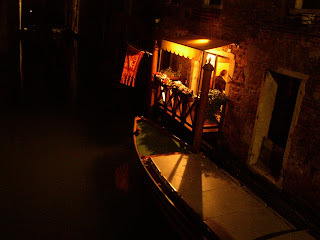 Light flickered off roofs and I was woken each morning by bells peeling across the square and the smell of spiced bread rising from someone making deliveries below. 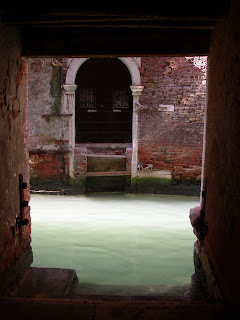 A Vivaldi and then a Bach violin concerto in the hall of a medieval prison had such beauty and yet evoked such painful memories that I had to force myself to stay. Now I feel I have lost track. 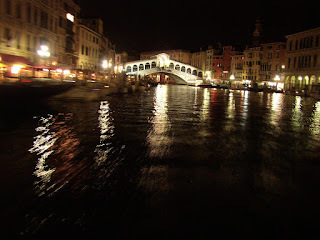 I keep thinking about that place and wondering what I'm doing. In 1939, while the rest of the world was at war, a Japanese scientist called Muroga was busy performing some peculiar experiments on silkworms. He was trying to find out what caused the silkworm to pupate - and his experiments were simple but conclusive. What he did was to tie pieces of thread (presumably silk since it is so strong) around various parts of a silkworm's body. The silkworm in question was on the point of making a cocoon, that is at the end of its fifth instar. When he ligated the head from the body, so that no fluids could pass from one to the other, he found that the lower, posterior part of the animal pupated as normal (as in d above). However, when he ligated the head and the first segment down of the thorax, he found that the animal failed to pupate at all (as in b). The source of the hormone that controlled pupation was clearly somewhere in the first segment - and not the brain. Left: front view of head of silk with cutaway section showing brain (green) and corpus allatum (red) and subesophageal ganglion(blue). Right: view from side. As you can see from my crude diagrams (I hope) there were several contenders. To find out which was responsible he ligated another silk worm, again separating the head and first segment from the rest of the body, and transplanted each organ in the lower part of the body in turn. Given how the size of these caterpillars this must have been skilful work. He found that only when he transplanted the subesophageal ganglion (shown in blue) did the caterpillar pupate. Therefore the hormone that controls pupation is in this subesophageal ganglion. There was more to come. Similar experiments on younger caterpillars showed that the subesophageal ganglion was implicated in moulting too. 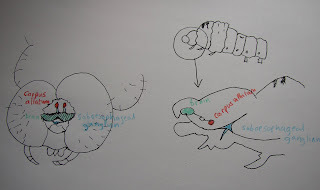 In fact both the subesophageal ganglion and the Corpus allatum was necessary for moulting, but the effect of the Corpus allatum died away as the larva in its fifth and final instar matured. Perhaps this is why pupation can occur. Maybe the hormone from the Corpus allatum dies away leaving the hormone from the subesophageal ganglion in charge and the caterpillar can now turn into a pupa without another moult. There were some even more bizarre experiments done on some more hapless silkworms involving brain transplants however I shall have to leave those for now. Just now I have to show Hodmandod Minor how to feed the silkworms. Still my silkworms grow. 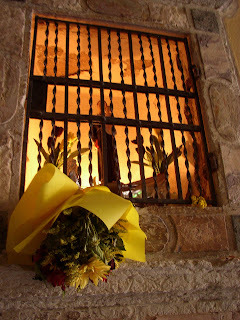 They shed their skin leaving an image of themselves impressed there like the shroud of an icon or a holy relic. Then they eat again and grow. 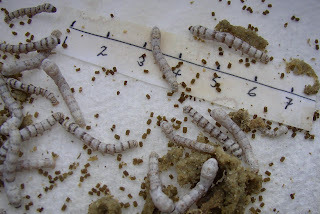 Silk worms at 15 days old. The scale is in centimetres. 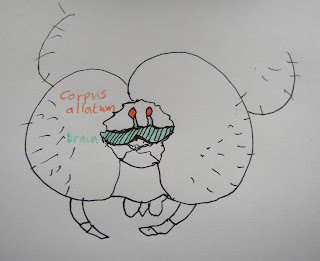 Sketch of silkworm's head showing the location of the brain and Corpus allutum. The fact that they are not integral to the brain was of interest to a Frenchman called Bouhniol. 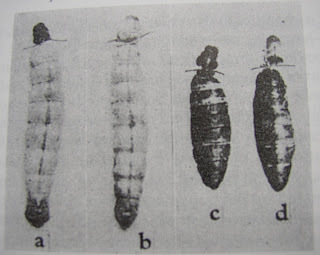 In 1937 he managed to excise the Corpus allutum from some silkworms in their fourth instar (that is caterpillars before their fourth and final moult) and found that they then changed into pupae without moutling. Similarly, if he removed the Corpus allutum from silkworms in their third instar they missed out two of their moultings. This experiment was extended by a Japanese scientist called Kin. He removed the Corpus allutum from a silkworm early on in its fourth instar and then replaced it. He found that if he did this quickly enough all was well and the silkworm moulted as usual. However, if he delayed the transplant a few days the moulting didn't occur and the silkworm went straight to pupa. Clearly enough time had elapsed for the hormone that initiated the pupation process to come into play. Futhermore this pupation hormone was not secreted by the Corpus allutum but by something somewhere else. 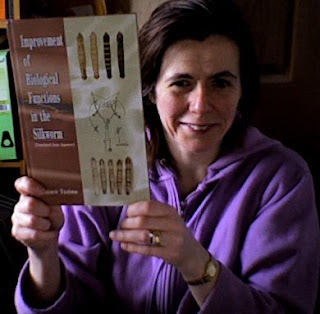 This result obviously piqued the interest of the entomological world because they then performed some more interesting experiments, but I am still trying to understand these and shall write another post when I do. 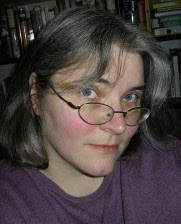 Yesterday Debra Hamel gave an informative and interesting review of the Kindle application on her ipod touch. 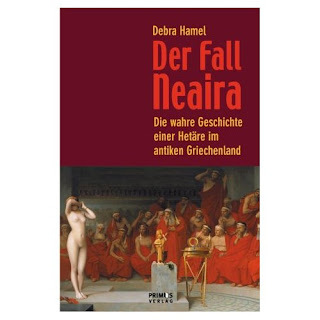 Today I came across another review by Jakob Nielsen, substantiating much of what Debra said. They are both worth reading. Just come back from the gym (treadmill, step machine, rowing machine and everything I could find to challenge my quads - still working on my knee) and found this on the doormat: 'IMPROVEMENT OF BIOLOGICAL FUNCTIONS IN THE SILKWORM' by Yataro Tazima (translated from Japanese) swiftly dispatched by the Book Depository. I've been so looking forward to reading this. I don't really see how this day could get any better. 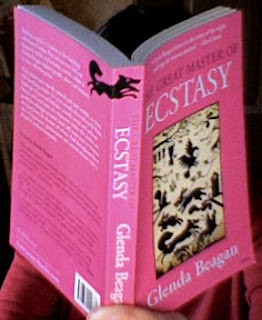 The Great Master of Ecstacy is Glenda Beagan's third collection of short stories. The cover of the volume I have here is different from the one shown on Amazon but I like them both. This one reminds me a lot of the silhouettes which illustrate Gillian Clarke's poetry, and so for me has promising connotations. 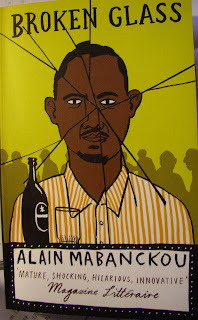 The first long 'short story' (75 pages) has the same title as the book, and I really enjoyed it. It starts with a shaman called Kieren and the young girl he takes in. Soon Kieren is murdered but the story is not about this; it is about who Kieren was and how he came to be who he was - a story that delves into Welsh folklore and unorthodox spirituality - a fusion of ancient and modern ghosts. 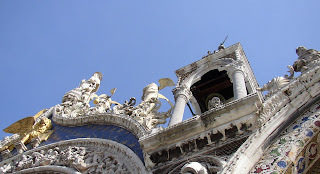 The characters in this story are also a product of this place: both the sacred and the more profane. The sacred ones are the shamans, the 'masters of ecstacy' according to the well-known expert Mircea Eliade, and can arise in a family without warning. It is a calling to the past and the landscape and cannot be denied, even when it causes suffering and family scission. This is just the first story, although the rest are much shorter. I am looking forward to dipping in and reading more. Last night, somewhere between Mold and Flint (which are the names of towns in north Wales and not metaphors - although they might as well be) I crawled along at slower than a walking pace, testing my clutch control (and also it turns out this morning, my runner's knee), watching the lights of the cars in front of me brighten and fade, and the clock count away minutes in the dark. There is a point when anxiety falls away, a realisation that happens next you are going to be so ridiculously late and you might as well let your mind wander. And I remembered, more than ten years ago now, crawling forward as slowly in exactly the same spot, snow on the road, mobile phone the size of a small book in my hand, ringing on ahead to the school where I taught and asking if it was worth continuing and being told yes. Six hours later I was still in the same spot. Around me cars had been abandoned and the occupants had taken to making snowmen and pelting each other with snow balls, but I sat where I was. Around twelve-thirty I had eaten my packed lunch but I was thirsty, and dusk was falling. I'd rung Hodmandod Senior and asked him to pick up the boys from the child minder and I was wondering how cold it would get at night. But then, ahead of me, the traffic started moving. I turned on the engine again and crept slowly up the slope, guided by the police, the wheels not engaging, and my legs trembling as I attempted to apply the gas, the clutch, the brake. At the top of Halkyn mountain they'd opened up the crash barriers which allowed us to turn back, but last night we just crawled on, mile after mile, eventually reaching the point where roadworks had caused two lanes to merge. That was all it was. All that crawling because of this. I arrived at the book launch in Rhyl precisely five minutes before the end, but I was glad I hadn't decided to turn back - I enjoyed seeing people I knew but hadn't seen for a long time: Penny from that same school in the snow, Dewi another writer, Chris from the Academi and another Penny my editor. To console myself for my journey I bought three books : THE GREAT MASTER OF ECSTACY by Glenda Beagan (whose launch it was) which is a novella and collection of short stories; MY FIRST COLOURING BOOK by Lloyd Jones (who I met last year) and BLUE SKY JULY by Nia Wyn which I have been meaning to read for some time. 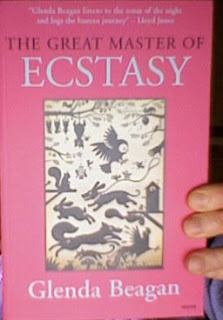 ECSTACY starts with a reference to shamanism so I am immediately interested, and COLOURING BOOK is 'themed on all the colours of the rainbow' which sounds an excellent precept too. 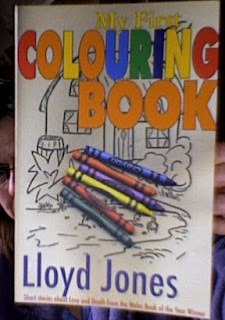 Since I still haven't read Lloyd Jones's first book 'Mr Vogel' I think I might well indulge myself in a Lloyd Jones fest very soon. BLUE SKY JULY was book of the month on radio 5, book of the week on radio 4, runner-up in the Wales book of the year and has recently been published in the United States where it has been picking up more accolades. It is an extraordinary poetic memoir about a mother whose child has severe physical disabilities and her fight to do the best she can for him. It is a short book and makes compelling reading so I swallowed it whole last night when I got back. It's one of those books that fills you with admiration for the author - not only because of the way it is written but because of her attitude to her child and the world. Despite the tragedy it is uplifting and reminded me very much of what David Cameron said about life with his own child, and also of what my brother says about his son. In some ways, it seems, these children can make you love them more. 'He's a great boy, Mikey.' My brother sometimes says about Michael who is severely autistic. My brother is not as eloquent as Nia Wyn, but the sentiment is the same. 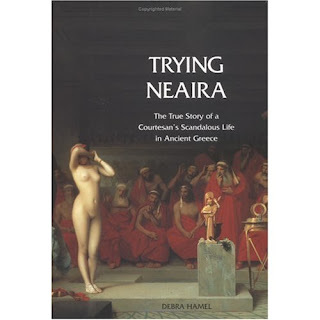 Like Nia my brother, his ex-wife and all the people at his school keep trying. They know there'll be no miracles but the important thing to do is to appreciate the small signs of progress. 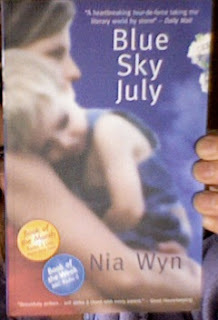 It is an important message for life I think, and the message in Nia Wyn's book. We have to keep going - up the snowy hill, past the seemingly interminable roadworks - making the most of the feeble taps and signs that some of what we do will some day make sense. In this Nature News item there is a brief description of something I think should be happening in the UK. Why keep producing cars that no one wants? Why supplement the industries making the cars? Instead use that expertise to produce something that will help the planet - in this Swedish case wind power. Why not extend this excellent idea to other useless items? So I have been trying to think of two lists: 'do need' and 'don't need' and wondering how many skills can be diverted. Maybe I'm being naive here - but surely that would go some way to solving two crises - the economic one as well as the climatic one. In fact it seems so obvious to me there must be some good reason why it's not happening. Here is the start of my two lists - any other contributions gratefully received. (As you can see I have included some items (marked with an asterisk) that aren't strictly necessary for physical survival but with the idea that the heart too must be fed). 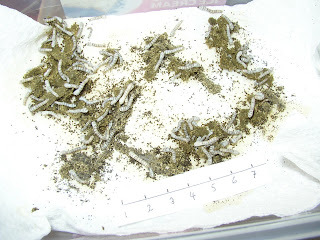 Silk worms at 9 days old. At first glance they look like cinders. They have the same greyness against the barely-green feed. Before they move they look a little like the remains of twigs, or maybe the fossilised remnants of coral or brachiopods. It takes a short time for my eyes to adjust. It is like looking into the dark. Then, perhaps in response to the lid coming off and a short rush of cool clean air, they stir a little. Some are like cobras; they lift the swelled and slightly flattened head-ends of their thoraxes, and sway before me. Only then does my eye truly fasten upon them and I can see them. They are about a centimetre long now and their bodies have filled out a little more so they look like real caterpillars. It is becoming easier to distinguish them. There are different colours and different markings. Some are a pale brown, but the rest are varying shades of grey. Some don't move at all, and on closer inspection these immobile silk worms are clearly moulted skin. Perhaps they are the first moult. However it is difficult to see which have moulted and which have not because there is no dramatic change in appearance. I read somewhere that they only make silk in their last instar, but maybe that should read they only make copious amounts of silk in their last instar. The silk glands are clearly there from the start because apart from the fine mat of silk that soon coats their food, they dangle from my tweezers like a spider when I try to clear out their box. But whereas such a captured spider would frantically spool out more silk and escape, the silkworm is more nonchalant. It doesn't struggle. 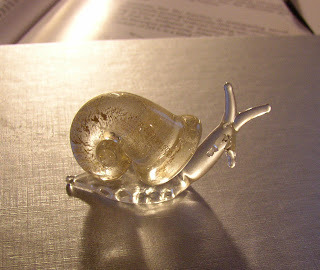 In fact it barely moves. Instead it seems to wait patiently (or mindlessly) to be placed somewhere else. After all, a silkworm is close to being a manufactured animal. For years they have been bred in captivity and cannot exist in the wild. They exist because men have made them so. It is as though they passively accept their lot, ponder over us a short while with their raised heads, and then continue grazing.